The 148th Regiment was comprised of seven companies from Centre County and three each from Clarion, Jefferson, and Indiana counties. The regiment formed at Harrisburg's Camp Curtin in September of 1862. The regiment was assigned to the Army of the Potomac and fought at Chancellorsville in May of 1863, where it lost 164 men. On the second day of the battle of Gettysburg, the regiment was engaged in the Wheatfield, losing another 125 casualties. It was engaged in the Bristoe Station and Mine Run campaigns before going into winter camp. The 148th was engaged in all the major battles of 1864. Owing to deployment as pickets, the regiment lost only 1 man at the Wilderness. At Spotsylvania the regiment lost 301 casualties. It was engaged at the North Anna River, Cold Harbor, and the initial assaults against Petersburg. 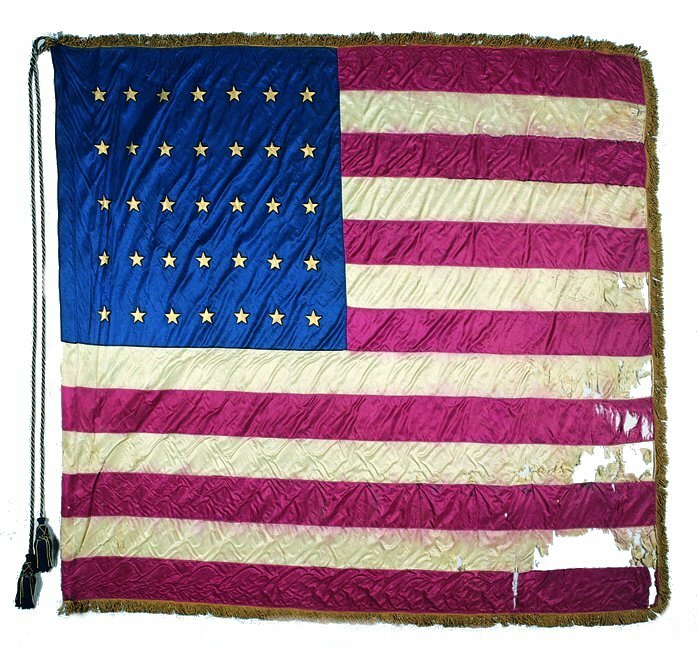 The regiment' state color was captured at Ream's Station and apparently never returned to the state of Pennsylvania, since it is not present on the list of flags returned in 1905. After fighting in the Appomattox campaign, the regiment participated in the Grand Review and was mustered out of service. The Second National color, which is shown, is a 35-star color produced by Alexander Brandon. It is unique, because the arrangement of the stars differs from the majority of Pennsylvania national colors, which were issued from the Philadelphia Quartermaster's Department. Source: Richard A. Sauers, Advance the Colors: Pennsylvania Civil War Battle Flags Vol. II (Harrisburg: Capitol Preservation Committee, 1991), 443-445.